In Copenhagen, traffic signals along “green wave” routes are timed to provide a constant flow of green lights to bicycles traveling at 20km/hour. Bicyclists who ride at this speed will never hit a red light all the way to the city centre. In the Netherlands, “green wave” routes are provided for bicyclists traveling between 15 to 18km/hour. 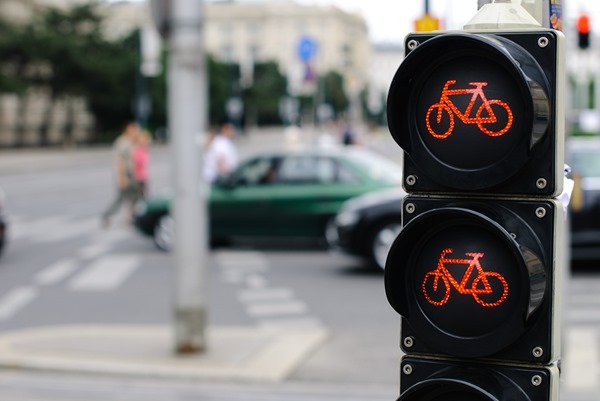 Outside of green wave routes, traffic signals often give priority to bicyclists over cars, allowing bicyclists to wait the minimal amount of time for a light to turn green. These initiatives are just a couple examples of pragmatic solutions in bicycle-friendly cities that ease traffic congestion by providing significant incentives for people to choose bicycle transport over driving. Copenhagen’s main bicycle route facilitates more than 30,000 bicyclists each day. But these initiatives have an obvious side benefit too: they help encourage good behaviour by creating disincentives to break the law. Bicyclists in Copenhagen who may otherwise ride faster are encouraged to slow down to 20km/hour in order to ride the “green wave”. Furthermore, a bicyclist is less likely to run a red light if she knows that the traffic signal will change within a reasonable amount of time. Here in North America, amidst our car culture, we see the opposite happen. Traffic laws and infrastructure designed for motor vehicles unfortunately creates incentives for bicyclists to break the law, resulting in bicyclists being cast in a negative light as “scofflaw” cyclists. One example of scofflaw behaviour that I frequently engage in is performing illegal left hand turns. Given our inadequate bike infrastructure, legal left hand turns are often more dangerous than indirect (illegal) left hand turns. Similarly, when traffic signals aren’t designed with bicycles in mind, bicyclists often end up running through red lights. Case in point: While in New York City last weekend, I used Citi Bike as my primary mode of transportation. Read my review of Citi Bike here. While the protected bike lanes were wonderful and comfortable, the traffic signal design, which was designed for motor vehicles, made it awfully tempting to break the law and run red lights. For example, while riding down the 9th Ave protected bike lane at a relatively slow pace, we hit red lights at almost every intersection. Obeying the law would put bicycling on par with walking pace, since a bicyclist would need to wait for a full 3-phase signal cycle to complete at almost every block. Thus, it was no surprise to me that most bicyclists safely passed through a red light when the intersection was clear. Other bicyclists rode fast enough that they could hit most green lights, which are timed for motor vehicles traveling at about 50 km/hour. In the eyes of onlookers, red light jumpers are “scofflaw” cyclists. But it is bad design that creates incentives for bicyclists to jump red lights. Even as a tourist in New York, I surely wasn’t going to sit at red lights all the way down 9th avenue, so I safely and courteously jumped my fair share of reds over the weekend. This is an example of how road infrastructure that was designed primarily for motor vehicles can make bicycling uncomfortable, unsafe, or inconvenient. This pushes people away from using bicycles and result in more cars and traffic congestion on our streets. Instead, transportation planners should be looking at the bigger picture and designing our streets to move as many people as possible, not necessarily to move as many cars as possible. More people on bicycles means we can move more people throughout our cities at a lower cost. Initiatives that provide incentives to choosing bicycle transportation over cars will help achieve this goal. Couldn’t have said it better myself. Motorists don’t understand our point of view but we understand their point of view because we all have spent our fair share of time in vehicles. i sent the writer a link to your article. NYC Avenue lights are timed for 30mph. Drivers routinely encounter frustration when heavy traffic doesn’t allow such speeds, and they have to sit through multiple light cycles. C’est la vie. 1. Check for cops before running the light. I know this sounds like a way to weasel the system. But when you slow down enough to check for cops, you’re also slowing down enough to avoid pedestrians, cars, etc. 2. Dismount your bike and walk through the red light. I’ve done this a number of times in front of cops. Never got a ticket (which would be for jaywalking anyway). Once I did it right in front of a traffic guy holding up his hand as peds crossed in front of me. He actually said “thank you” as I walked my bike through the peds. around; a bike weighs 15 kg maximum, it makes a great alternative. As much as I agree with cycling, just because you are on a bike does not mean you can go through red lights (pedestrians included). Imagine if every motorist had that mentality, that they could just go through it because they did not like the inconvienience of having to wait a minute. I ride a motorcycle and I have had two cases where a cyclist blew a red light in front of me, and fortunately I was able to stop before running into them, and in both cases they just carried on with nothing more than a wave. In Guelph last week, this exact thing happened except the motorcyclist was unable to stop in time, sending both to the hospital with serious injuries. Its not the infrastructure that creates the problem, it is impatiant people who feel that a one minute wait at a traffic light is too much. Instead of blowing through red lights, maybe plan to leave sooner (just as a moterist would factor in) so you’re not in such a rush and feel the need to ignore laws. Traffic lights only exist to control and regulate motor vehicle traffic to attempt to reduce the carnage that they cause. If an intersection is empty and nobody is around, most pedestrians would use their common sense and continue walking through if they know they can do it safely. Motor vehicles need to wait because if they make a poor decision they can kill or maim somebody else. Long before cars were around we didn’t have or need traffic signals. Many bicyclists jump red lights because there are no sensors at intersections, so if there are no cars there, the lights won’t trigger a change. This is bad design. Relegating bicyclists to ride a walking speed is bad design. Drivers wouldn’t stand for it either. That’s why the lights are timed at about 50km/h in New York City. Let me get this straight…because traffic lights are timed for automobile traffic, you are physically/mentally/emotionally incapable of waiting until a light turns green before you ride your bike across an intersection? And wow…this comment makes me seem way more conservative than I am in real life, but I’m tired of bicyclists having some sort of power trip that they think they are better than the rest of us who walk or drive cars and therefore deserve preferential treatment and can do no wrong. I can’t tell you how many times a bicyclist has almost hit me while I was walking down a SIDEWALK in DC and then they have the nerve to get mad at ME for not jumping out of their way. Yes to more bicycling. Yes to more bike lanes. Yes to more bike share. And a big NO to the sense of entitlement and elitism that more and more bicyclists seem to be acquiring. Your refusal to follow the rules that were written for wheeled, vehicular transportation amount to a structural obstacle encouraging poor bicycle safety? That is absurd. Obey the red light. If you don’t and get hit by a car, you have NO excuse.